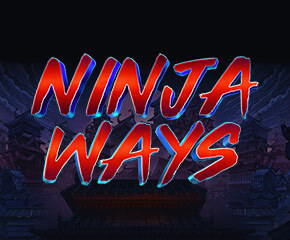 Ninja Ways is a Red Tiger Gaming video slot with 6 reels and 4,096 was to win. This means that combinations are formed when players match identical symbols on adjacent reels. This is also a medium volatility online slot with a 10,000x jackpot available for lucky players to win. This potential exciting slot is designed for a low stake and casual slot players as well. Read on to get to know more about this slot game in the review below. How To Start Playing Ninja Ways Slots? With the only 20p, you can start playing this slot game today. The maximum bet per spin for this slot is £40. Once your bets have been placed, you can activate the Autoplay option and play between 10 to as much as 100 successive, uninterrupted spins. This slot comes with a 6×3 reel set with low-value card icons with an oriental-themed design. There are four high-value icons with an oriental theme. One of the four high-value symbols is an “N” icon. When you match up 3, 4 and 5 of the “N” icon on adjacent reels, you will receive 1, 2 and 4x your total bet. Land 6 and receive an 8x stake multiplier. You also have a Ninja Wild symbol which displaces other symbols on the reels except for a Free Spins Bonus Icon. By landing 5 of the Free Spins symbols on adjacent reels, you will activate the free spins feature. In this slot, the number of awarded Free spins vary. This is because each of the free spins bonus symbols that are landed on the reels will grant you their own awarded free spins. As you play the free spins round, you are open to receiving one or more of three randomly generated modifiers which will help to boost your overall earnings. You could actually earn an 8x stake multiplier on each free spin. 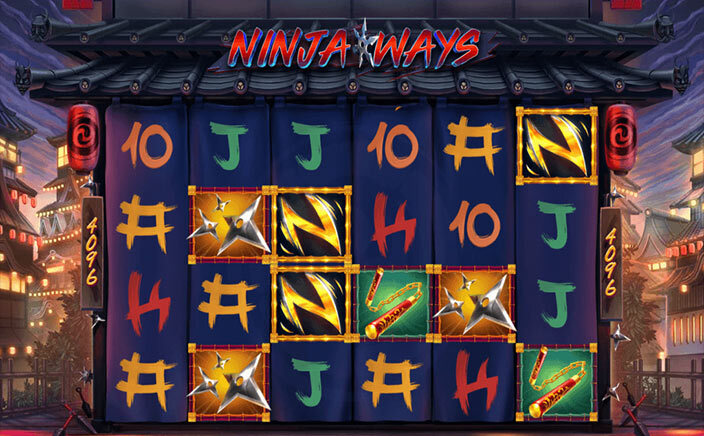 There are 3 modifiers in Ninja Ways slots which are randomly triggered in both the base and free spins round. These modifiers are the Ninja Door, Ninja Wilds and Ninja Ways. The Ninja Door reveals mega symbols (2×2, 3×3 and 4×4) that help to boost wins. For the Ninja Wilds Modifier, you have wilds on the reels which grants the players winning multipliers of as much as 8x. On the other hand, the Ninja Ways Modifier has matching icons on the reels which enable the players to earn wins and enhance their payout. It is a pleasant video slot with decent graphics and a nice soundtrack. Winning combinations are made by landing matching symbols on adjacent reels in this medium volatility slot. There is also a 10,000x Jackpot available in this slot.